SATISFACTION GUARANTEE: We understand your order is priority, as such we will make every effort to provide prompt replies and deliver your products on-time. We will also make every effort to provide accurate research and information about your products. Please contact 310-SIGN Inc. via phone, fax, or email with any questions or concerns. We're always happy to help. CUSTOMIZED PRODUCTS: Products which are considered customized, specialized or personalized are non-refundable. ARTWORK PROOFS: Proofs are not supplied by default but are available upon request. Written approval may be required prior to production. Requests for artwork proofs may delay shipment of your order. Artwork, mock-ups, files or other items supplied or designed by us shall remain our property. PRODUCT SPECIFICATIONS: Product colors, material choices, and other specifications are subject to change without notice and may vary. Colors are reproduced as accurately as possible. Items may be discontinued at any time without notice. PRODUCT PRICING: Prices reflect list price cost in Canadian (CND) currency and are current at the time of publication. Prices do not include any freight or taxes. We reserve the right to change prices without notice. PAYMENT TERMS: The following credit cards are accepted; Visa, Mastercard. 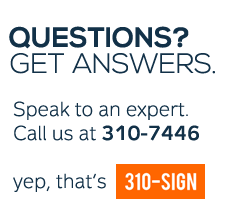 310-SIGN Inc. accepts Net-30 day terms with approved credit. To get started, fill out the credit application. CANCELLATION: Once an order is placed it immediately goes into production. As such, we are unable to accomodate order changes or cancellations. Should you require a cancellation, please contact customer service immediately to discuss any possible arrangements. OVER/UNDER RUNS: High volume print orders are subject to a 10% variance and shall be billed accordingly. Over runs and under runs include, but not limited to, printed stickers, labels, decals, tags or signs which contains the same graphic on all items. RETURNS: If you need to return any stock product, please submit a return request or contact customer service. A restocking fee may apply. 310-SIGN Inc. warrants its products to be free from defects at the time they are sold. The customer is responsible for testing the products for their intended use. 310-SIGN Inc. cannot be held responsible for the customer's inability to use the products purchased. 310-SIGN Inc. liability is limited to the replacement of the products sold, provided it can be determined that they were defective at the time they were sold. REGULATORY INFORMATION: Many of the 310-SIGN Inc. products found on this website have been designed to comply with one or more industry standards. SINCE WE HAVE NO KNOWLEDGE OF YOUR SPECIFIC HAZARD, FACILITY OR SITUATION, IT'S IMPOSSIBLE FOR 310-SIGN INC. TO GUARANTEE THAT YOUR USE OF OUR PRODUCTS WILL COMPLY WITH ANY LAW OR STANDARD. THE INFORMATION IS ACCURATE TO THE BEST OF OUR KNOWLEDGE BASED ON OUR REVIEW OF THE INDUSTRY. 310-SIGN INC. MAKES NO GUARANTEE OF INFORMATION ON THIS WEBSITE. User/buyer assumes full responsibility for compliance with applicable safety standards and regulations for the products purchased and created. Information, in the form of standards, citations, and quotations, provided herein is intended for general purpose only, and should not be construed or relied upon as legal advice or legal opinion on any specific facts or circumstances. We shall not be responsible for any damages of any kind that may arise out of, or result from, reliance on the regulatory information within catalogs, product descriptions, information pages, videos or communications. USE OF TRADEMARKS AND LOGOS: Customer represents that it has the right to use all logos, trademarks, service marks, trade names, and all other related artwork to be printed. In consideration of the acceptance of this order, customer warrants that the finished article is not and will not be an infringement of any valid trademark, service mark, copyright, patent, or similar right. Customer agrees, at its own expense, to fully indemnify, hold harmless and defend us, our agents, employees, officers, and successors from and against any and all liability and costs arising from or in connection with any claim or legal action brought against us charging such infringement. We reserve the right to refuse to print anything we deem to contain improper or infringing artwork. We reserve the right to use product images and samples in promotional applications. All images are the property of 310-SIGN Inc. and shall not be used without the written consent & permission. PRODUCT MARKING: All 310-SIGN Inc. products have the 310-SIGN Inc. logo, 310sign.ca website address and/or part number printed in small print on the front of the product. Sign products may also have the 310-SIGN logo, website and re-order information on the reverse of product. This is for both re-ordering purposes for the end user and as a recall mechanism to manage the return of product if necessary. Custom products can be printed without the 310-SIGN logo, website and part number if requested at the time of ordering. Stock products can be printed without the 310-SIGN markings at the time of ordering for an additional charge. If an order for stock product is placed on our website with the request for no logo/part number, the customer will be contacted by our sales team to discuss extra charges. Additionally, any stock product ordered without a 310-SIGN markings/part number will be considered custom products and are NOT RETURNABLE. LIMITED PRODUCT WARRANTY: We warrant to the Buyer that our products are free from defects in material and workmanship; limiting our obligation under this warranty to replacement of the product if we are satisfied it was defective at the time of sale. This warranty does not extend to any persons obtaining the product from the Buyer. THIS WARRANTY IS IN LIEU OF ANY OTHER WARRANTY, EXPRESS OR IMPLIED, INCLUDING, BUT NOT LIMITED TO, ANY IMPLIED WARRANTY OF MERCHANTABILITY OR FITNESS FOR A PARTICULAR PURPOSE, AND OF ANY OTHER OBLIGATIONS OR LIABILITY ON OUR PART. UNDER NO CIRCUMSTANCES WILL WE BE LIABLE FOR ANY LOSS, DAMAGE, EXPENSE, INCIDENTAL OR CONSEQUENTIAL DAMAGES OF ANY KIND ARISING IN CONNECTION WITH THE USE, OR INABILITY TO USE, OUR PRODUCTS. There are no warranties extending beyond those described and, where applicable, additional written warranties as to certain special products of ours. Our sole responsibility and the Buyer's exclusive remedy for any claim arising out of the purchase of any product in this catalog is repair, replacement or credit, where applicable. In no event: (1) shall the cost of the remedy exceed the purchase price; (2) shall 310-SIGN Inc. be liable for any special, indirect, incidental, consequential, or exemplary damages, howsoever arising, even if we have been advised of the possibility of such damages. LIABILITY: 310-SIGN Inc. cannot be held liable for any loss, damage, or expense of any kind as a result of the use, or inability to use 310-SIGN Inc. products.